Flatter your bump and new curves in this Happy Mama pretty maternity nightshirt, cleverly designed to accommodate your new curves. Two openings both sides will allow easy nursing. Perfect nightwear during pregnancy, labour and post pregnancy. 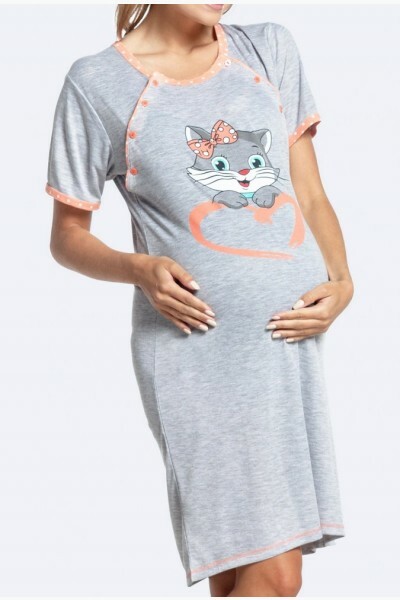 Incredibly simple, this fabulous nightdress is made in soft stretch jersey, which feels fantastic against sensitive skin, and is designed to stretch and grow with your changing curves for a perfect fit at every stage of pregnancy. Each of them has a lovely vibrant colour, and a cool, cheerful pattern on the front. Great item created for pregnant ladies to make them feel comfortable and trendy.